It seems unreal and dreamlike that the week spent in New York now resides in the past, because, as you know, weeks and even months of toil and preparation had slowly built up my anticipation and nervousness. It had been a long, arduous journey, but definitely one worth travelling. 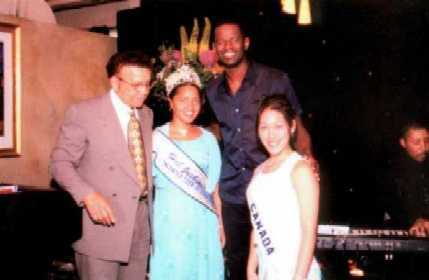 In all honesty, I had never even heard of Hal Jackson's Talented Teens International before I was crowned Miss Canada at the April 1st competition. That was the first step into this madness of opportunity that I took. Even then, I thought that many of the other girls were very talented and I was sure one of them was going to win. I have pictures and pictures of me standing there, with the runners up at my side, clutching a huge bouquet of flowers as if for dear life, blushing from ear to ear! I can't even describe the joy that pulsated through my heart the moment it settled in that I had won! Me! I laughed and hugged and shook hands with people for a long time afterwards, but this I hardly remember, being subjected to fluttering butterflies and a blurry vision. From that moment on, I knew it was going to be hard work. And I was quite right. The whole trip was a whirlwind of activity. More than anything else, I noticed the insanely long hours of rehearsal time, sometimes up to 8 hours a day! Don't get me wrong, much of it was spent watching the choreographers figure out the dance routine on the spot, while we sat around chatting. (By the way, they were such nice people! And great dancers!) I, personally, didn't have much of a problem learning the moves, but I noticed their infinite patience and dedication to those who needed the extra time. We spent so much time in that rehearsal studio that it became our second home, literally. Nicole often fell asleep there like it was her own bed! But I don't blame her. We were all exhausted. Other than practice time, we had a few outings that required dressing up and putting on our best smiles. Which wasn't a problem because we were having so much fun anyway! The places I found most memorable were the dinner on the yacht, Amateur Night at the Apollo theatre, and the fantastic musical Blast! Being a musician myself, I was amazed and astounded by that performance especially, and fancied myself actually taking part in it one day. Despite all the things we did during the week, the greatest reward was spending time with the other girls. I honestly believe that I've made some friends for life in that crowd of talented individuals. I definitely got along well with everyone, just some more than others. Now I feel an attachment to them. We've been through some rough things together, such as those of us who didn't make it into the top 10, but we comforted each other. And yet, as disappointed as we were for not making it, we still felt this sense of pride for those that did, and the sincere congrats that were given in the dressing room truly warmed my heart. All in all, it was a great experience! Even though I didn't win, I spent some fun times with the girls, met some really famous people, and ate some really good food! If I could do it again, I definitely would, and I would take lots of pictures, because this is the kind of thing you'll want to remember for the rest of your life!